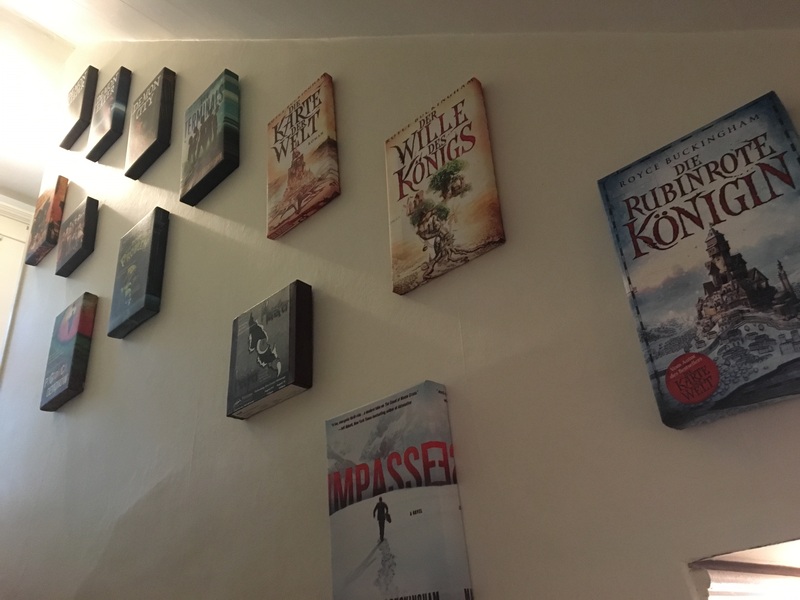 My books include fantastic creatures and locations brought to life by wonderful artists and illustrators on my book covers…..and sometimes lead to bigger-than-life art for display at my home. In The Dead Boys, a tree irradiated by nuclear waste feeds off of the life energy of boys. To keep living, it needs a new boy every ten years. I think that my friend, Jill, did a great job depicting the twisted nature of the tree and the boys that it traps inside of it. Bargle surprised Royce on his birthday in 2013. Here he is with Royce, Aiden and Aspen. Published first in the US under the title, Goblins! An Underearth Adventure. Then published in Germany as Garstige Gnome. Now available as The Goblin Problem in the U.S. via Kindle or print-on-demand for a copy – both on Amazon.com! Bargle’s Story: When I received a copy of Garstige Gnome (The Goblin Problem) from Germany, I fell in love with Illustrator Max Meinzold’s depiction of one of the goofy goblins in the story. My family decided it had to be the character, Bargle. Years later, my wife met chainsaw carver Ryan Anderson, and commissioned him to do the carving above as a surprise birthday gift. Bargle is now one of the family! Below, behold the awesome map detailing the Lands of Abrogan in my German Series, Mapper (also available for English readers). My wife had the illustration printed on large format paper, then antiqued it by crumpling it up, staining the paper with tea-colored water and burning the edges. She had it matted and framed by a local shop and viola, an art piece for our entry way. I can’t wait to showcase the next round of maps illustrated for my soon-to-be released book, Die Klinge des Waldes (Deathbringer, Blanvalet). Every day, I enjoy seeing the many different book covers for my work with these canvas prints.